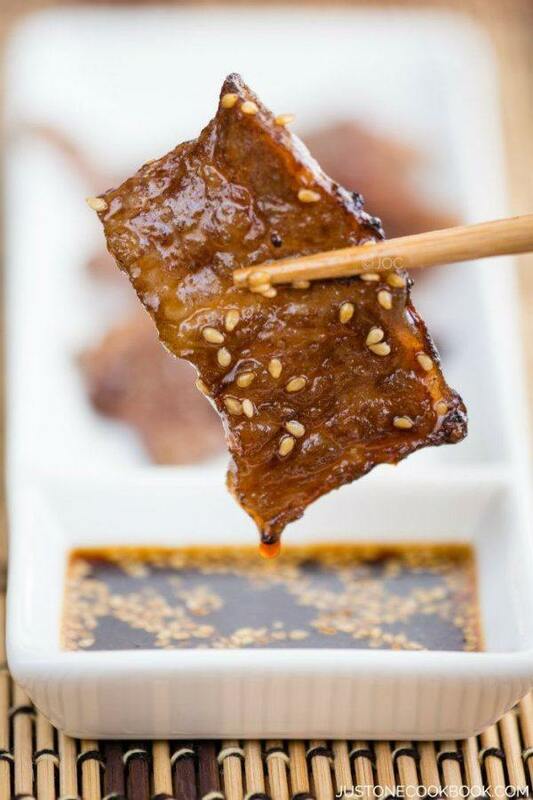 Yakiniku sauce is a sweet & flavorful Japanese BBQ sauce. It’s perfect for dipping thinly sliced of well marbled short rib and other grilled goodies. It’s summer and that means time to BBQ! In Japan, Japanese style BBQ is called Yakiniku (焼肉) and literary means grilled meat in Japanese. It’s a popular dish originated from Korea. Each Yakiniku restaurant in Japan offers their own dipping sauce and it’s called Yakiniku no Tare (焼肉のタレ), or simply tare (タレ). 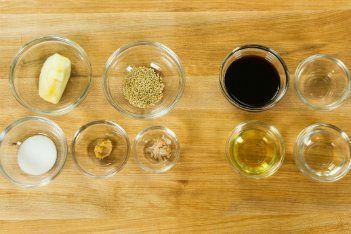 Tare is the key seasoning for Japanese BBQ as we do not typically marinade the meat prior to grilling. Sweet & flavorful BBQ sauce perfect for dipping thinly sliced of well-marbled short rib and other grilled goodies. 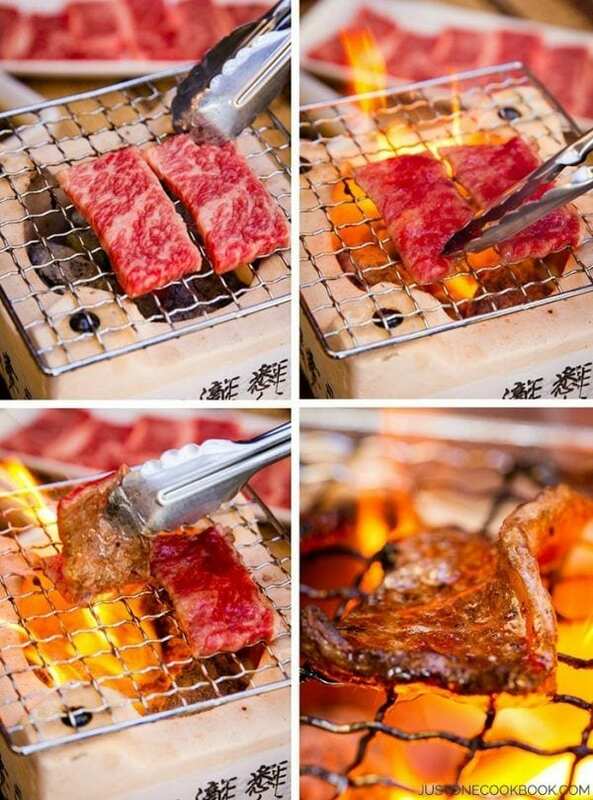 For Yakiniku, bite-sized meat (usually beef and offal) and vegetables are grilled over gas/electric grill or charcoals. 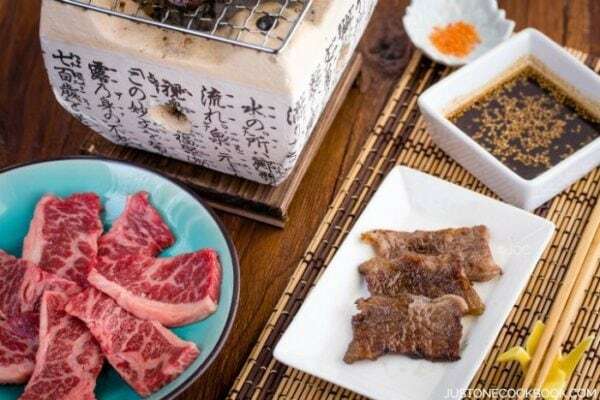 Whether you are enjoying Yakiniku meal at home or in a restaurant, everyone sits around the BBQ grill and cooks the meat throughout the meal. It’s a great menu for 6-8 people as preparation is very minimal. 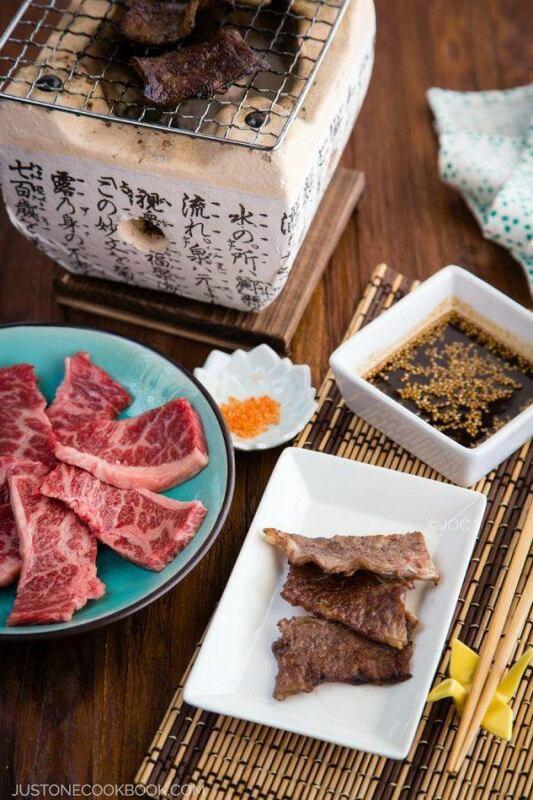 Generally the meat is not marinated for yakiniku; therefore, the quality of meat is very important. The well-marbled short rib is usually thinly sliced and grill over charcoal for 30 to 60 seconds on each side (you only need to flip the meat once to preserve juicy flavor) and then dip in the sauce to eat. 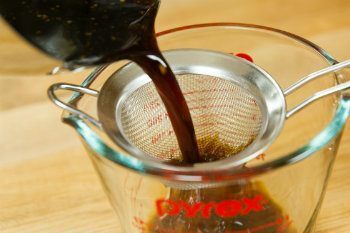 Typical “tare” is made of soy sauce mixed with sake, mirin, sugar, garlic, fruit juice and sesame seeds. This particular sauce was inspired by my favorite Yakiniku restaurant in the Bay Area called Juban, which I’ve been going for many years. My sauce may not exactly be the same but I adapted from Juban sauce to my family’s liking. Dip the grilled items in the sauce to enhance the BBQ flavor. The well-marbled meat coated with this sauce is so delicious. Hope you enjoy! Don’t want to miss a recipe? Sign up for the FREE Just One Cookbook newsletterdelivered to your inbox! And stay in touch on Facebook, Google+, Pinterest, and Instagram for all the latest updates. Thank you so much for reading, and till next time! UPDATE: A lot of readers asked me about the grill. This grill is called “Shichirin.” I bought one from a Japanese hardware store in SF but you can also purchase on Amazon. It looks great on photography, but to be honest, it’s not practical for yakiniku. In the US, small BBQ cooking stoves resembling shichirin are referred to as “hibachi.” Hibachi is actually a small heating device in Japan which is not usually used for cooking. Shichirin was marketed as “hibachi” by mistake when they were introduced to the US. 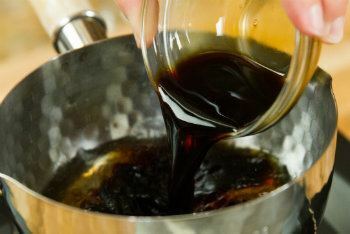 Add sake, mirin, sugar, rice vinegar, soy sauce, miso, katsuobushi, and simmer for 1 ½ minutes. Add the sesame seeds and grated apple. Let the sauce sit for half day or overnight in the refrigerator to let the flavor mix well together. The sauce may taste too salty by itself without grilled meat. When you actually dip the meat in the sauce, the two flavors complements each other.